On September 27th, 2010 my wife and I moved in to our new apartment a couple of minutes away from our old apartment and we had previously called to schedule Comcast to come out and perform a transfer of service to get our DVR Box and our Cable box online in our new apartment. Comcast came out and performed the transfer of service free of charge and since we were moving into a larger apartment we opted to go ahead and get another digital box for one of our bedrooms while we were at it. The technician that came out explained to me that this was his first installation where he was on his own and apologized ahead of time if it took longer than we expected. I told the technician that I understood and that it wasn’t an issue. The technician did what he needed to do including making the connection in the junction box at the back of the apartment building, cutting and putting ends on coaxial cables for our DVR, Cable Modem, and Digital Box, and installing a splitter for the DVR and Cable box. The technician tested the line for the DVR and the cable modem and everything seemed to be working well so he went into the bedroom for the new digital box. The digital box was having some issues and displaying an error code so he powered the box off and back on and it appeared to work fine so he finished up his paperwork and left. About a week went by before we had a chance to use the cable box in the bedroom and when we turned on the TV it was giving the same error code it did at the original installation prompting me to call Comcast and have them come out to take a look at the box. A technician came out the next week and at first glance he said that the cable box was dead and went ahead and swapped it out for a brand new box and told me that the issue would be resolved. I tested the box myself and was pleased to see that the box was indeed working as it should. The technician finished his paperwork and left and everything was fine for about a week. The next week I began seeing 20% to 30% packet loss on my internet connection and I ran numerous tests to Google.com as well as several other sites and servers around the United States and abroad to ensure that it wasn’t something specific to a particular site, switch, router, or network outside of Comcast’s control. I directly connected the modem to the computer and tested to ensure that it wasn’t the router and I switched out ethernet cables as well to ensure it wasn’t a bad cable however the issue continued. At this point I determined that something was wrong and it wasn’t my equipment so I called and scheduled for a technician to come out and look into the issue. The earliest the technician could come out was around four days later which was less than satisfactory as my livelihood requires an internet connection and I had to resort to a cellular 3G connection in the meantime. Finally once the technician came out he hooked up his tester and made sure that our cables and ends in the wall were in good shape and he informed me that they were and that there didn’t appear to be any issues between the junction box and the wall plate in the wall. He then proceeded to look over the coaxial cables that the original installer put in place and found that the original installer had failed to properly put the ends on the coaxial cables. He was rather shocked to see this issue as he said it was a very simple thing to fix and very odd for it to be overlooked when putting ends onto a coaxial cable. If my memory serves me correctly he said that the original installer neglected to put a seal on the connector, or something similar. The technician fixed the cable, the one that the original installer brought and installed, and I ran my tests and the packet loss was gone and the signal to the modem was once again excellent. Everything has been absolutely wonderful from that point until today, when I went to pay my Comcast bill. I saw that my Comcast bill had $50 in “Unbilled Activity” which you can see by clicking on the thumbnail of the bill at the top of this post. 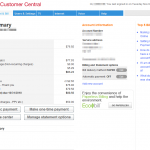 I had no idea what these charges were for so I called Comcast’s customer service to discuss the charges. I was connected with a customer service representative who explained that the $50 charge was for the technician to come out to repair the service, and that the issue was with our equipment and not theirs. The representative even went so far as to say that the installer had replaced a “line drop connector” however when I asked her what a “line drop connector” was she said that she didn’t know and that I would have to get in contact with a technician. I told the representative that this was unacceptable and that there was no way that I am going to pay a charge for something if they can’t even tell me what the charge was. I had the call escalated to a supervisor as the customer support representative couldn’t adequately explain the charge. I was connected with a supervisor and she explained to me that it was to replace a connector in the face plate on the wall which didn’t happen and yes, they’re charging me $50 for a $0.50 connector. I told the supervisor what the technician did when he came out, that he said it was indeed an installation error, and that it was a simple fix and that the technician told me that I would not be charged for the visit. The supervisor said that it was a legitimate charge and that there was nothing that she could do about it. At this point I was becoming extremely frustrated and I asked to be escalated to the next level supervisor at which point the individual told me that management did not take phone calls and that there was essentially nothing more that I could do. I asked the supervisor to transfer me to another supervisor hoping that I would get a hold of somebody with a real sense of customer service and would at the very least get me to somebody who could resolve the issue, or advise me on how to further pursue the issue to get it resolved in a timely fashion. The next supervisor that I spoke with on the phone simply told me that it was against company policy to escalate a phone call any further and that all they could do was escalate it on their end, but didn’t explain to me what that entailed or what to expect. The supervisor even went so far as to actually say that he agreed with me that in this particular case this was an extreme lack of quality customer service but he told me that there was literally nothing more that he could do to help me. Essentially it comes down to the fact that the original installer that was contracted by Comcast to install my service in the new apartment failed to do so correctly and I’m now being billed for the incompetence of the original installer. When contacting Comcast customer service I’m being told that the technician that fixed the issue put a code down that caused me to be billed and since it was a legitimate code that there is nothing that they can do to waive the charge. If Comcast doesn’t in some way, shape, or form let me know that they really do appreciate me as a customer and tell me that they are going to make this situation right, at the least, I’m going to look into alternate providers for my services. My business is growing at a decent pace and I’m looking at opening a physical office location for my employees to work out of which would have been a Comcast Business connection in addition to the data and TV connections that I currently have in my apartment but at this point it looks as though Comcast is going to be potentially losing out on my future business as well as my current business. I sincerely hope that Comcast hasn’t grown so large that they don’t care about their individual customers and don’t care if they’re unhappy, receive poor customer service, or simply choose to no longer do business with Comcast due to these reasons. Comcast: make this right, or I’m going to do my absolute best in every way, shape, and form to make sure that anybody I ever have any interactions with be it business, personal, or otherwise knows exactly about your services, the lack of customer service, and everything that these issues entail. The ball is in your court, I hope you make the right decision. I apologize for the troubles with your bill, and also the customer service you received. We want to help you out and make this right. If you would like, send us an email and include a link to this page. We will look into this issue and somebody will reach out to resolve. Have a great day! Comcast is horrible in my opinion. They still say that I owe on a cable box that we returned. We switched cable companies. Unfortunately, many areas don’t have the option to switch. We had Verizon as well but they overcharged too much. Well what’s really messed up is that they added a $50 credit onto the account and we cleared our balance. 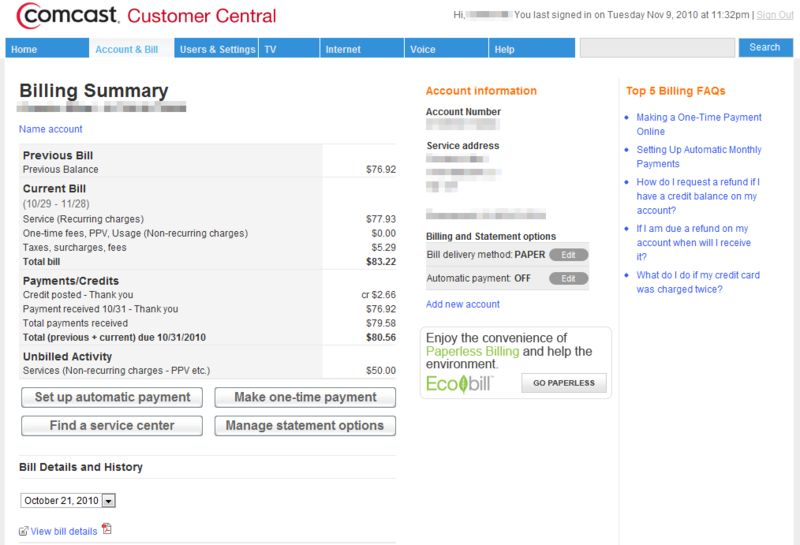 We then got a new bill this month which is $30 more than it should be *and it includes a $20 courtesy credit from Comcast*… When we called Comcast up to ask what was going on with our bill nobody on the phone (not even a supervisor) could explain what the extra charges were for, or why our bill was so high. I’m starting to think I may just be better off with DSL… I had DSL for years and never had problems with the service itself or my bill. Ya. Understandable. Matter of fact they probably have the worst customer service ever. They was rated the worst in customer service at http://consumerist.com/ out of all the companies for this year or last year. That should not have happened! As an employee of DISH Network I know that if a technician is sent for whatever reason there is a code that should be on the account where if a technician needs to be routed again the customer should not be charged. Now maybe if you tried to move the equipment or something that would have caused it to go out, the charge is understandable. However that is not the case, even in a mistake, after explaining what happened that should have been waived immediately before being escalated. At DISH I feel they pride themselves on making sure to take care of their customers right and the first time. So did they end up waiving that charge at all?